Sitting in the shade on a hot summer’s day allows us to really experience our native shade-loving species. Many are pretty and have unusual foliage, adding to their allure. One plant that’s been a shade garden staple for many years is the Island alumroot, Heuchera maxima. The scientific name is most commonly pronounced HER (or HOY)-ker-uh MAX-im-uh. 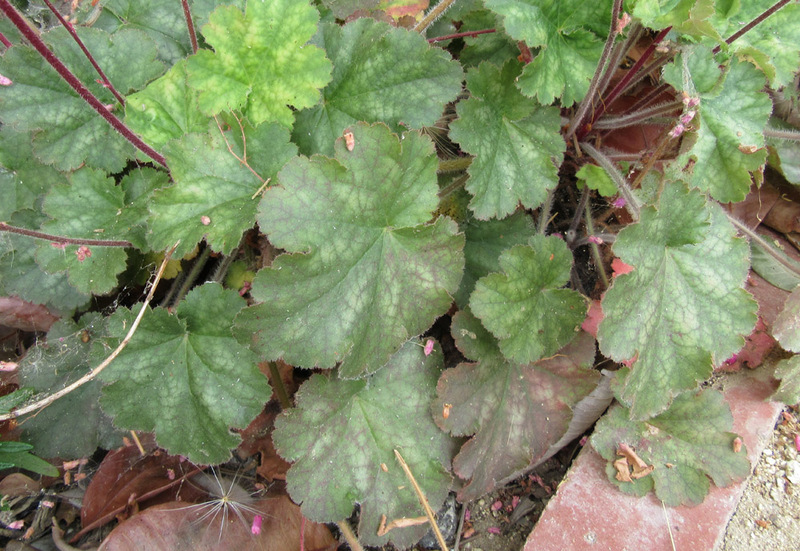 The Heucheras are an interesting group of herbaceous perennials in the Saxifrage Family (the Saxifragaceae). Members of this family generally grow in moist shady places; they are often used similarly in gardens. Among the California saxifrages are the Boykinias, Heucheras, Jepsonias, Lithophragmas, Micranthas, Suksdorfias, Tellimas and Tolmieas. 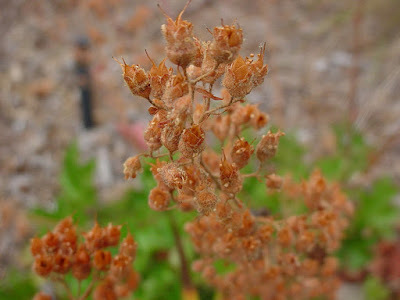 Of these, the genus with the most species is Heuchera. The Saxifrages share a number of common features. Most have rounded or heart-shaped leaves that grow in a mound at the base of the plant (a basal rosette). Most are perennials, dying back to a stout root in winter. The flowers grow in stalks above the leaves. Some have medicinal properties, and have been so used. And most grow in forests or riparian areas, often in shade. Heuchera maxima is one of the coastal species. It’s native to the Northern Channel Islands, off the coast of Santa Barbara. In the wilds, it grows in moist, shady, north-facing sites, often in canyons or on ocean cliffs. Island alumroot is a member of the chaparral plant community; it always grows at elevations less than 1500 ft. (500 m.) in nature. Fortunately, it’s available to California gardeners and widely used in gardens in warmer climates (USDA Zones 8-10). All the Heucheras have pretty, rounded leaves and Heuchera maxima is no exception. Its leaves are slightly succulent, lobed, with scalloped edges. The leaf color is green, but may be mottled or two-tone. The entire plant is slightly hairy. Leaves have long petioles and are tightly clumped in a basal rosette. With a little water, the entire plant appears neat and tidy much of the year. 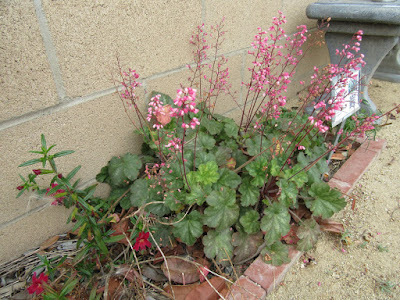 Heuchera maxima begins to bloom in spring and can bloom off-and-on through summer with a little water. 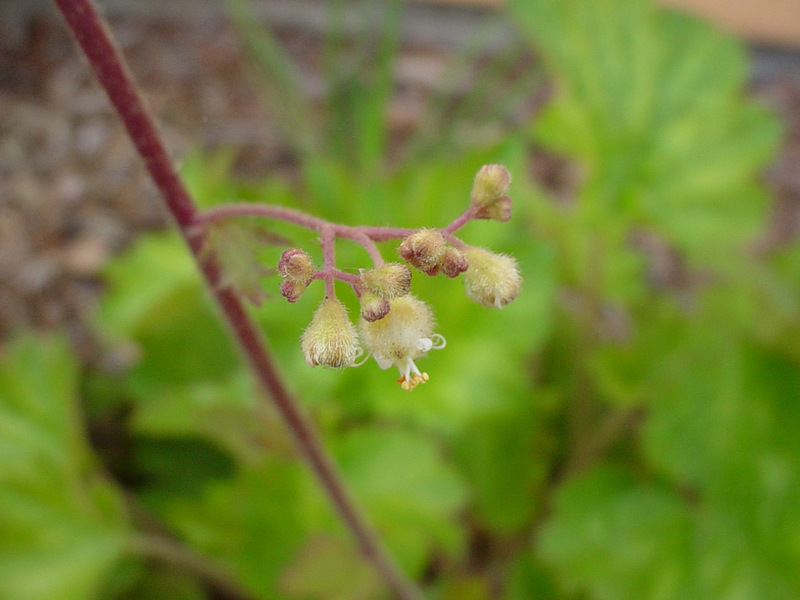 The blooms of Island alumroot are small, bell-shaped flowers on slender, upright flowering stems. The flowers of this species are white to pale pink and are clustered at the tips of side branches on the stem. The flowers are less densely packed than those of the Seaside alumroot. 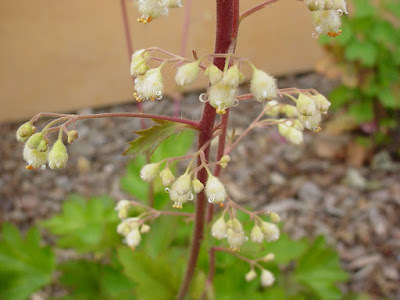 Several well-known, named Heuchera hybrids share the foliage characteristics of Heuchera maxima and the brighter flowers of the Arizona native Heuchera sanguinea. Hybrids between H. maxima and H. sanguinea range in color from white/pale pink to bright pink or magenta, and are very showy. Hybrid cultivars include 'Genevieve' (rose-magenta), 'Opal' (white), 'Santa Ana Cardinal' (large red), 'Susanna' (red), and 'Wendy' (pink), all developed at the Rancho Santa Ana Botanic Garden, Claremont CA. We feature ‘Wendy’ in Mother Nature’s Garden of Health. The Heucheras are loved for their ability to tolerate (even need) a shady location. In nature, this species grows primarily in moist, shady canyons. In the garden it does best with afternoon shade, under trees or on the north side of walls or buildings. We’ve grown it in clay soils; it can succeed in all but the poorest-draining soils. It looks good with a yearly application of a light (1/2 strength) fertilizer, particularly in sandy soils. 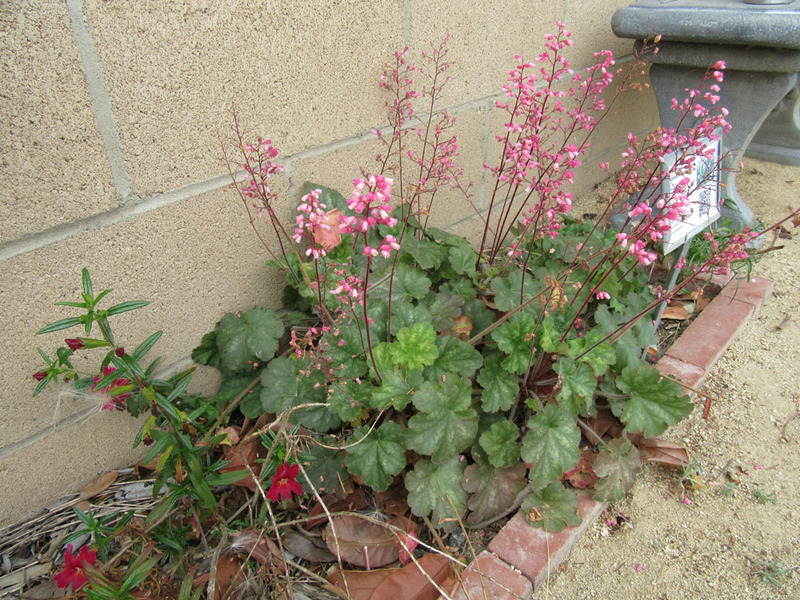 In dry climates like S. California, Heuchera maxima needs regular irrigation for the first year, until the plant is established. Then water two to four times a month for best appearance. Plants are actually quite drought tolerant (much more so than the eastern Heucheras) – but they need a little water to look good. We water our alumroots every two weeks from June to August in our clay-loam soils. Then we taper off water in September. 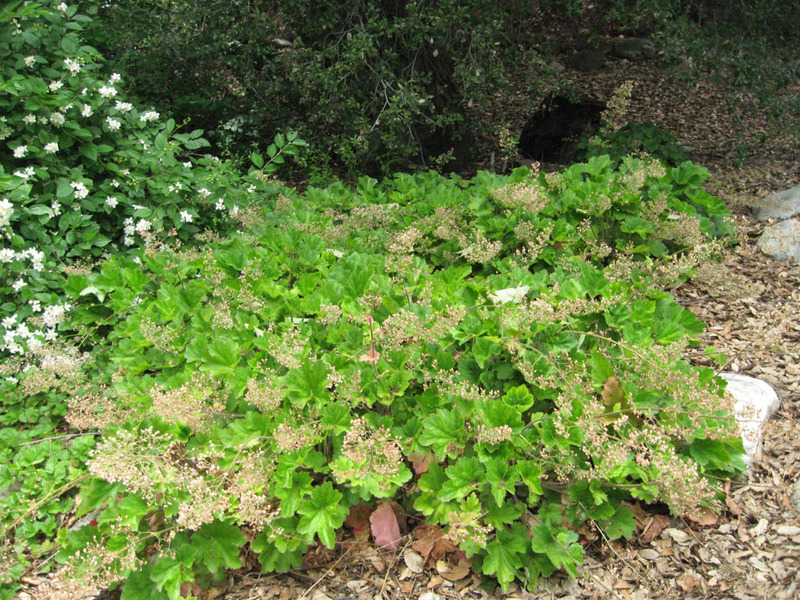 To conserve water, we recommend using a 1-inch thick organic mulch around Heucheras. Keep the area under the plants mulch-free to discourage fungal infections of the stems and leaves. Heucheras don’t need much in the way of maintenance. Cut off spent flower stalks for tidiness and to promote a longer bloom season. Remove old, dead leaves in the fall. If you’ve planted several plants, you may be able to collect seeds from the dry capsules and start some new plants. And divide plants as needed, usually every 4-5 years. When plants become crowded and blooming decreases, then it’s time to divide. Division is best done in early spring. So, why plant Heuchera maxima and its cultivars? First, these are charming, old-fashioned perennials, with a long history of use in gardens. 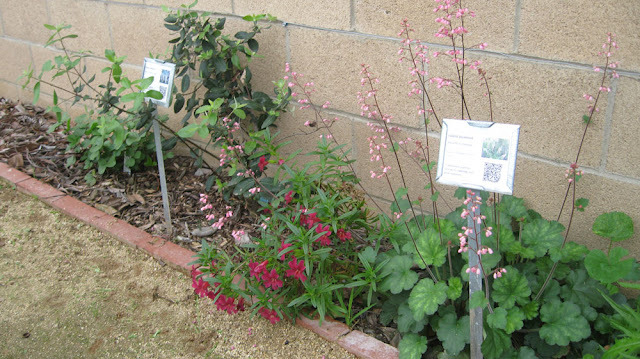 Most people have no idea they are California native plants; they look that ‘garden-like’. Their tidy appearance and low maintenance make them a good choice for many gardens – including front yards. They look equally appropriate in both traditional and contemporary garden designs. Heucheras are the perfect solution for shady parts of the garden. They provide a natural, woodsy element favored by many gardeners. They can be used as a ground cover (above) or to border shady pathways or flower beds. With limited water, they can even be used under native oaks. Heuchera’s small size makes them a good choice for narrow planting areas. 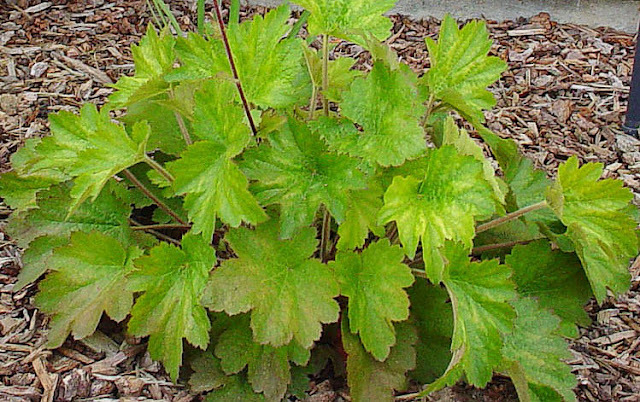 Heucheras can even be grown in deep containers (they have a tap root) on a shady patio. They are favorites of hummingbirds. Plant some near a garden bench; you’ll be rewarded by steady visits from these jewels of the air. The flower stalks also make a pretty addition to floral arrangements. Finally, Heucheras are known for their medicinal properties. The leaves and stems – but particularly the roots – produce chemicals that are strongly astringent and possibly anti-microbial. In traditional medicine, a poultice or extract of the roots was applied to skin wounds and sores to stop the bleeding and reduce swelling. An extract of the root was used as a gargle for mouth sores and sore throats. Note: this plant has strong medicinal properties and should not be taken internally. In summary, Heuchera maxima is treasured by western gardeners for its attractive foliage, pretty flowers and shade-loving nature. 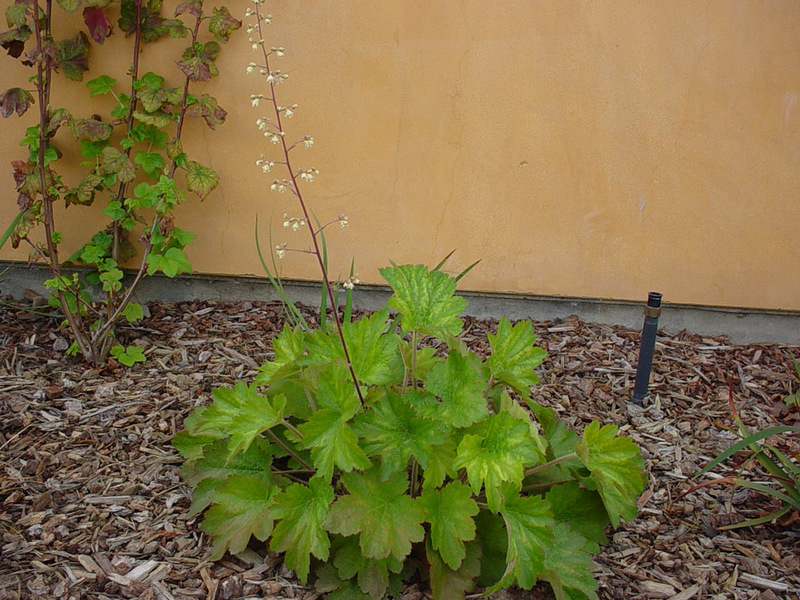 It’s hard to find an easier-to-grow plant that looks as good as the Island alumroot and its cultivars. 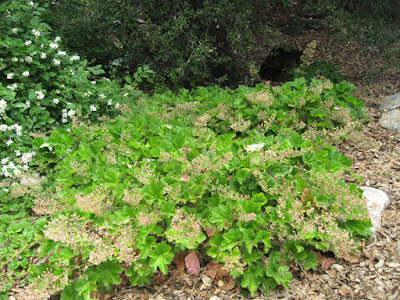 And if you’re creating a Channel Island themed garden, you’ll want to include this species in your collection. We hope you’ll consider adding this versatile plant to your own garden this winter. I remember seeing a whole field of these at Filoli - rare to see native plants there except in the one section by the cafe. They were so enchanting in the shade, drifting down a gentle slope. Thank you, very interesting and helpful!